Double opt-in confirmation for email marketing is a hot-button topic among online marketers. Some people argue, with all of our efforts to streamline entry forms to generate leads for our email marketing lists, adding an extra step for folks to confirm the email addresses is counterintuitive. Others believe the confirmation step builds stronger lists and improves the quality of leads collected. Regardless, in recent years, people have become much more concerned about online privacy and the security of their data. This trend has prompted a number of new privacy regulations focused on personal data, including the General Data Protection Regulation (GDPR) in the European Union (EU), the Swiss Data Protection Act, the proposed Data Protection Bill in the United Kingdom. There are similar regulations throughout Europe. The best way for businesses to be GDPR-compliant is to add double opt-in, thereby asking customers for their explicit consent. Beyond data privacy regulations, there are a number of reasons you might consider using double opt-in confirmation on your email marketing lists. I’m going to walk you through what double opt-in confirmation is, why you might use it and how you can enable it within ShortStack. However, single opt-in confirmation is still an option in countries with looser consent requirements (e.g., the United States), and I include information on this possibility as well. Beyond data privacy regulations, there are a number of reasons you might consider using double opt-in confirmation on your email marketing lists. What is Double Opt-In (DOI) and How Does it Work? Double opt-in is a process where individuals are asked to confirm their consent to receive email marketing from a list. They receive a confirmation link via email. There are two steps an individual must take to subscribe to a list where a double opt-in process is being used. A person fills out your form. 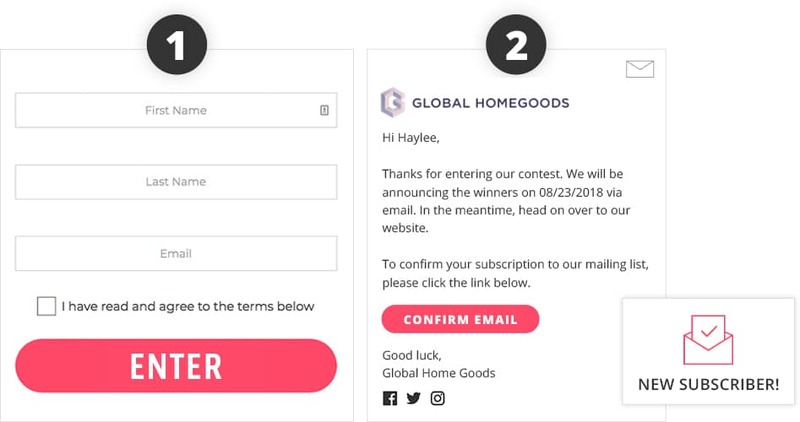 The form includes an email field and an opt-in checkbox if the form is collecting emails for purposes other than email marketing (e.g., contest entry, to see the results in a quiz, to vote for an entry in a contest, etc.). NOTE: For suggestions on creating GDPR-compliant forms, check out our post, GDPR Compliance for 2018: It’s easier than you think. An opt-in confirmation email is sent to the email address provided in step 1. The person receives the email, and when they click the confirmation link included within the email, they confirm their subscription to the list. Once someone confirms their email address by clicking the link, you can use their email address for email marketing purposes. Why should I use Double Opt-In? Reducing the number of fake emails associated with your list. Below are five advantages to using DOI for your email marketing lists. Adding the second step to confirming a subscription to an email marketing list improves the quality of the leads within that list. Why? The extra step takes a bit of effort from the subscriber. In clicking the link, they are opening the confirming email you sent them, and actively indicating they want to receive emails from your business. In short, the subscriber WANTS to subscribe! The higher-quality leads collected with double opt-in result in higher email engagement rates. This means a higher percentage of subscribers are opening emails and clicking the links in those emails. This seems obvious for opens — people who WANT to receive your emails are more likely to open them. However, click-through rate is calculated by dividing the number of clicks by the number of opens. Even in this case, DOI outperforms single opt-in. In fact, in a study by GetResponse, the click-through rate for DOI is four percent, double the click-through rate for SOI. Email-engagement rates are important for lead conversion, and for your email’s return on investment (ROI). It’s likely that somewhere within the emails you send, you have included a call-to-action (CTA). If your leads aren’t opening your emails, it could be because they aren’t seeing the CTA you are sending. But if you can double the number of clicks in your email, then this should also increase your likelihood for conversions and improve your ROI. Sending an email containing an opt-in link is a fantastic way to collect real email addresses. Why is this important? Let’s think about how fake email addresses might affect your list. Oftentimes, we ask folks to submit their email addresses to access a lead magnet. A lead magnet is typically an incentive, such as a PDF, an ebook, a video or a webinar. In our view, a prize can also be a lead magnet, so can a coupon or other special offer. 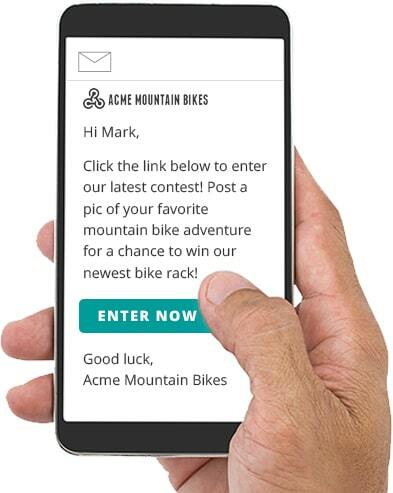 However, if the person who wants your resource or enters your contest but has no intention becoming a real subscriber, then they might enter a fake email address. If you don’t enable DOI for your list, then your list could include many fake email addresses. Why are fake email addresses bad? Because fake email addresses lead to bounces. There are two different types of bounces. A soft bounce occurs when you have a valid email address, but the email was too large for the recipient’s inbox, the recipient’s inbox is full, or the recipient’s email server is down. If you’re sending an email to an email address that doesn’t exist or is invalid, the email will be returned as a hard bounce. Hard bounces are removed from your list. However, these bounces impact your overall deliverability rates. Average bounce rates for most lists are between 2-3%, which includes both soft and hard bounces, although a list with a large number of fake email addresses could have a higher hard bounce rate. Why are fake email addresses bad? Because fake email addresses lead to bounces. Furthermore, why pay to send emails to fake email addresses? Hard bounces are removed from your list after the email is sent. With some platforms, you pay for sends, meaning the fake email addresses would count toward your cost of sending the email. With DOI, only those folks who confirmed their email address will receive the email, allowing you to keep your bounce rates low and preventing you from wasting money on a bunch of fake email addresses. Similar to bounces, SPAM complaints reduce your email deliverability rates. SPAM complaints signal to ISPs that your emails are unwanted. If you have a large number of SPAM complaints, then ISPs may start filtering your emails directly to an individual’s junk/spam folder. This is less likely to occur with DOI emails. After all, when you ask people to confirm their subscription via a double opt-in link, they are less likely to report your emails as SPAM. When you ask people to confirm their subscription via a double opt-in link, they are less likely to report your emails as SPAM. As long as folks unsubscribe via the unsubscribe link you include in your email, unsubscribes shouldn’t impact your deliverability rates. However, they do impact your costs. If you are sending an email to someone who unsubscribes, and the email marketing service you use charges for sends, then you are reducing your ROI. One of the most common reasons people implement double opt-in is to stay compliant with personal data protection laws. Although DOI isn’t explicitly required for the GDPR, many email marketing experts and platforms (including ShortStack), recommend using a double opt-in process to meet the GDPR standards. The GDPR asks for explicit and verifiable consent to collect and process individuals’ data. Using a double opt-in process helps to prove you are obtaining explicit consent. How do I Enable Double Opt-In in ShortStack? By enabling the “Require Double Opt-In” option on a Company Profile, all lists associated with profile will include the double opt-in requirement. This means only individuals who have clicked the confirmation link will receive the scheduled and follow-up emails you send using ShortStack’s Marketing Automation features. NOTE: Autoresponders are not affected by the “Require Double Opt-in” requirement. An autoresponder is the type of email used to confirm opt-in to a list, so someone doesn’t need to have opted-in to a list in order to receive the autoresponder email. Can I use Single Opt-In? That depends. As long as you don’t need double opt-in to help you stay compliant with personal data protection laws, such as the GDPR and the Swiss Data Protection Act, then you could consider using single opt-in instead. Why might you use SOI over DOI? Single opt-in doesn’t require people to complete a second step to opt in; all folks need to do to opt in is submit their email address. 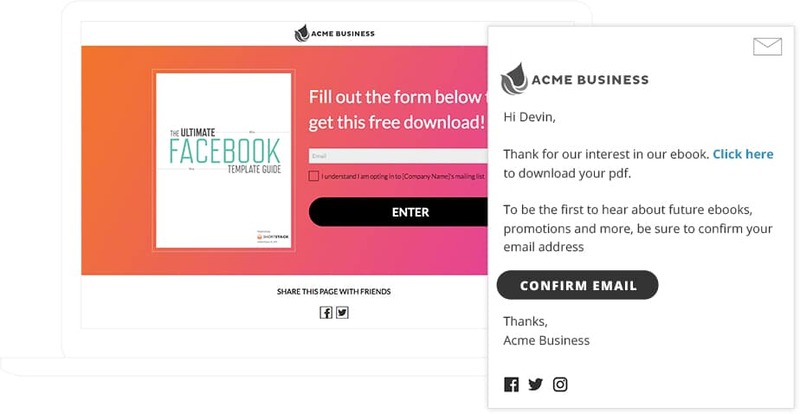 According to Litmus, between 20 to 40 percent of folks who submit their information to double opt-in forms don’t click the link in the confirmation email to become a subscriber. That’s a large drop-off from sign up to subscription. The process to subscribe is easier — there are fewer steps for those who are legitimately interested in receiving your email marketing to sign up. Diminished sender reputation due to higher bounce rates and spam reports. To sum things up: When building your email marketing list, you have two options for subscriber opt-in — double opt-in and single opt-in. The option you choose should be based on the goals you have for your list. ShortStack allows you to easily set up with option on your email marketing lists, allowing you to focus on designing your lead generation campaigns and the emails you’ll send your subscribers. If you have any questions about ShortStack’s email marketing features, feel free to email us at theteam@shortstacklab.com or check out this landing page. Located in the EU or collecting the personal data of people located there? Read our post, Are you GDPR-ready? How ShortStack Is Preparing for the May 2018 Deadline, to learn what ShortStack is doing to prepare, and check out our post GDPR Compliance for 2018: It’s easier than you think, to find out how you can stay compliant.